Square Aluminum Cafe Umbrella | Promotional Cafe Umbrellas with logo | Adco Marketing. Square Aluminum 7' Umbrella is a 7 ft x 4 ft panel Square market umbrella. The aluminum frame with wood grain for appearance. Polyester cover with wind vents. We like the durability and unique look of this cafe and restaurant umbrella. 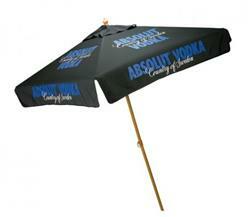 Ask us for samples and advice on custom market umbrellas! Production Times Available: 20 business days. Available Imprint Options: $5.00 run charge per piece for each additional color or location imprint. Carton size: 51 1/2" x 6" x 6"